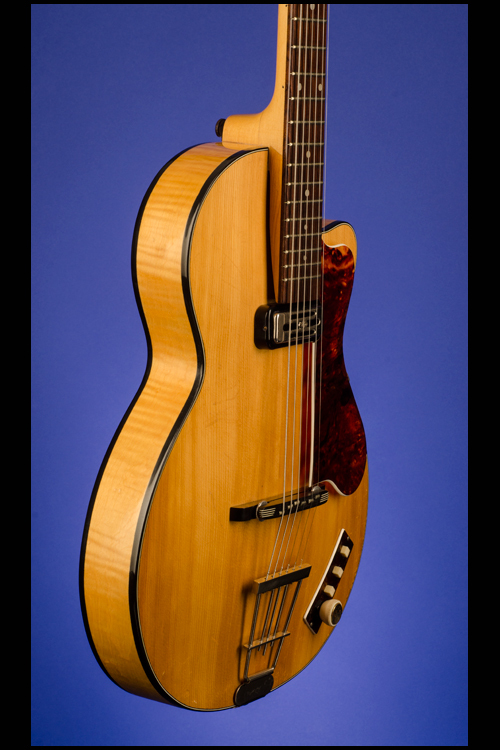 London (Model 125 semi-acoustic) Guitars | Fretted Americana Inc.
1960 Hofner Club 40 Distrubuted by Selmer, London (Model 125 semi-acoustic). This rare 'Natural' Club 40 weighs just 4.00 lbs and has a 13 inch wide, 2 1/8 inch thick, semi-hollow, lightly arched on the top and back, single-cutaway body. Two-piece natural spruce top with a one-piece lightly flamed maple back. The sides of the body are flamed maple and triple-bound bound in black. Single-layer tortoiseshell heel-cap with professionally added ebony strap buttons. Three-piece (maple-beech-maple) neck with a scale length of 24 1/4 inches, a nut width of just under 1 5/8 inches and a very comfortable medium profile. On the back of the headstock, stamped in blind is the serial number "1452". 'Slab' rosewood fretboard with 'triple-layer' nut, 'zero' fret and 22 original medium frets with inlaid 'graduated' pearl dot position markers. Ebony capped headstock with "Hofner Distributed by Selmer London, Foreign" and treble and bass clef in gold-leaf. Two-ply black over white plastic 'bullet' shaped truss-rod cover with three screws. Open-back strip tuners with rectangular plastic buttons with rounded edges. Single 'Type 2 Hofner Toaster' pickup with 'Diamond' logo' and an output of 7.42k. Original tortoiseshell pickguard, edged in white and secured by one pin into the side of the neck, another into the bridge and a metal bracket attached to the treble-side of the body. Single volume control plus three selector 'slide' switches, all on rectangular tortoiseshell panel (edged in white) on treble bout. Original Hofner 'teacup' control knob with securing grub screw. 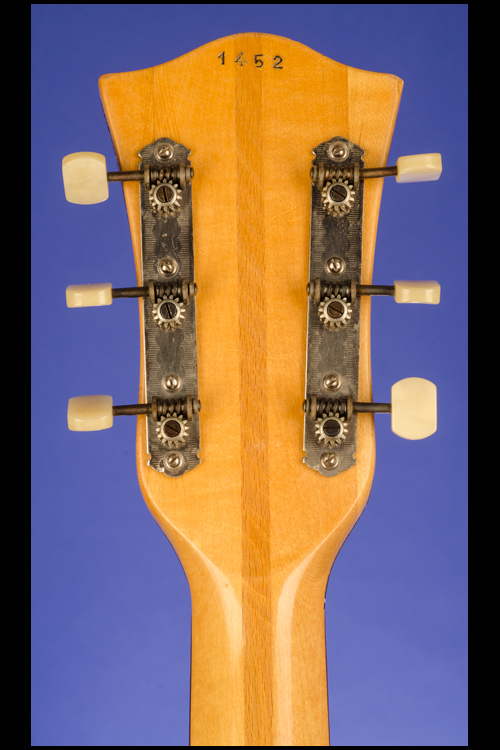 Hofner ebony bridge on ebony base with six individually adjustable saddles (actually lengths of fretwire). Hofner 'trapeze' tailpiece with "made in Germany" stamped on the bottom edge. This super rare little guitar is in near mint (9.25) condition with just a few small and insignificant surface marks on the spruce top. Minimal wear to the the first three frets only. Small black side-dot markers have been professionally added to the bass-side of the neck. The playability of this guitar is quite outstanding. Housed in the original Hofner five-latch, shaped black hardshell case with green felt lining (8.50). 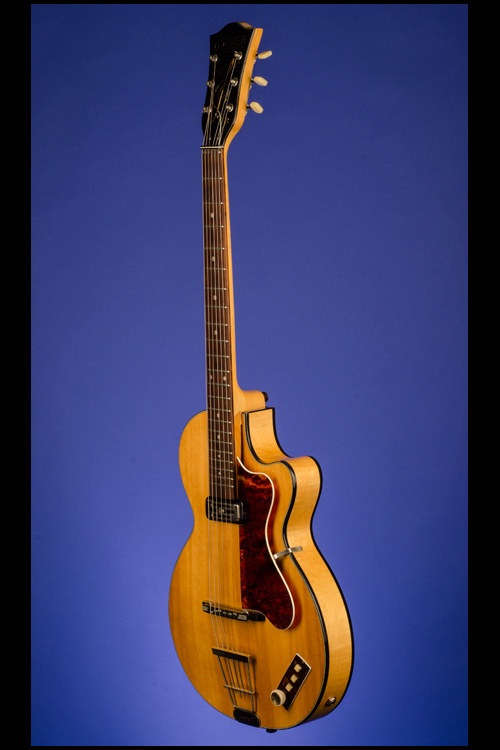 "The Club series of guitars are probably those most considered to be the Hofners that helped the early British rock heroes in their early careers. Photographs abound of John Lennon, Paul McCartney, Dave Gilmour, Justin Haywood, etc. clutching a Hofner Club in their youth. 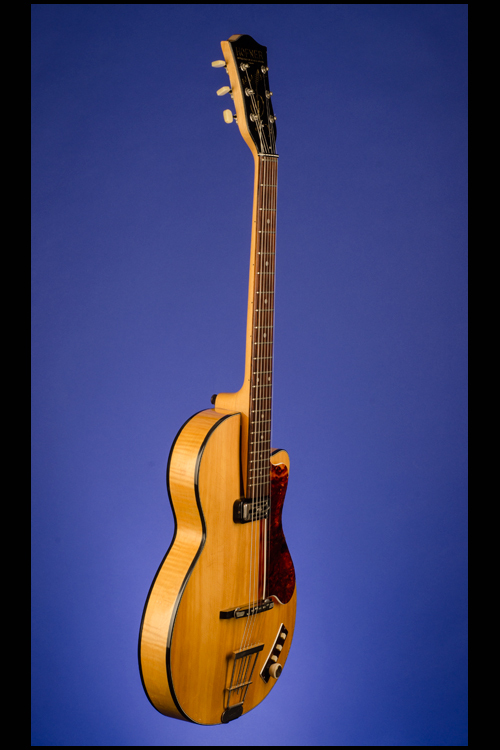 The Club was considered by most young guitarists in the late 50s to be the "business", until they were weaned away by such modern developments as the Futurama III or, if really lucky, an American guitar! There were three Club models to choose from in those days; the Club 40 with one pickup and modest timbers and ornamentation and the The Club 50 was its two pickup equivalent, and there was the 'super deluxe' Club 60. 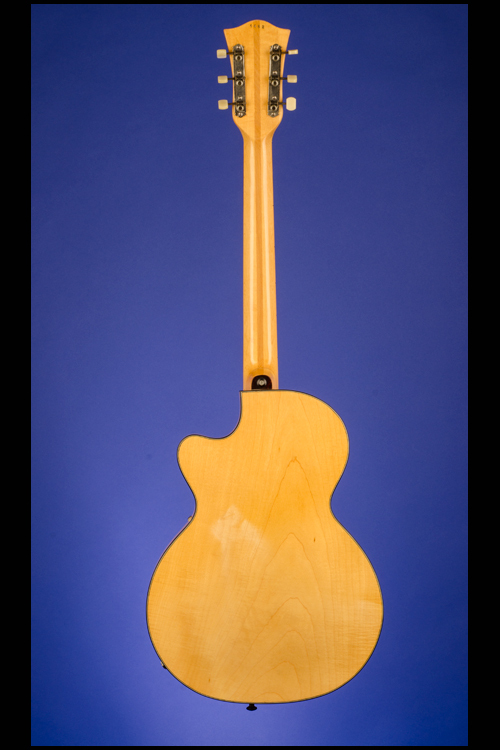 Despite a resemblance, in shape and size, to the Gibson Les Paul, the Clubs were of hollow construction using laminated timbers, and hence considerably lighter than the Les Paul. The tops were finished with spruce and back/sides flame maple book-matched backs. 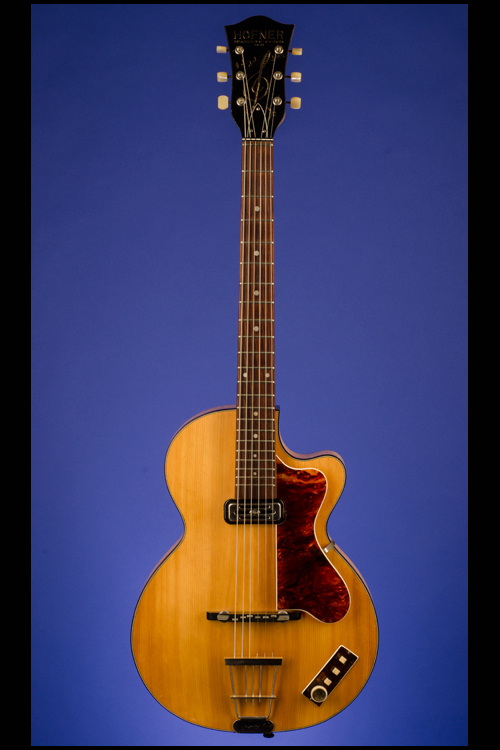 The usual Hofner blonde (natural) and brunette (sunburst) finishes were offered on all Club versions. 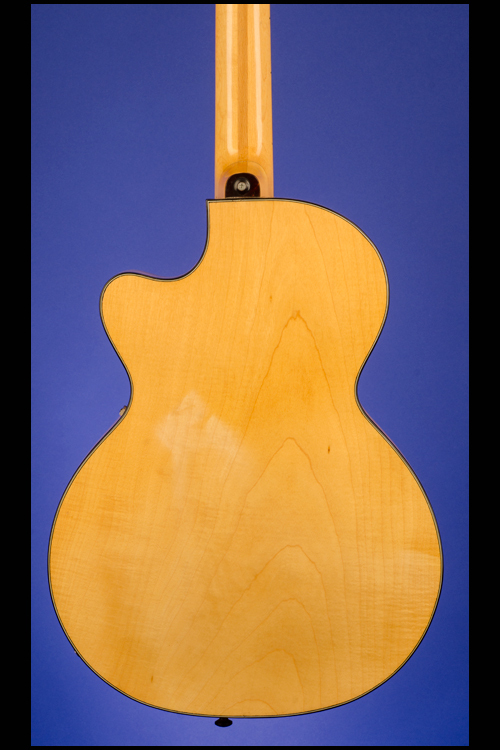 The neck on the Club 40 is of three-part construction, maple/beech/maple, capped off with a 'slab' rosewood fingerboard. The Clubs were much played in British rock bands during the late 1950's and early 1960's. The 125 and 126 were introduced in 1954. Selmer obviously took a liking to them, as they subsequently appeared in the Selmer catalogue in 1956 as the Club 40 and Club 50. 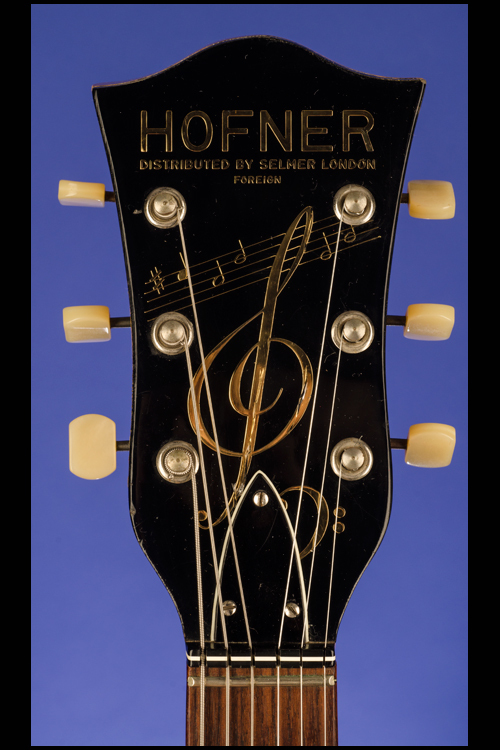 From around 1959 onwards, a distinctive "Treble Clef" headstock design was adopted, with the Selmer London logo incorporated. The Club 40 and Club 50 were the Selmer London versions of Hofner's 125 & 126 models. The Club 40 / 125 model had a single pickup and the Club 50 / 126 model had twin pickups. Other than the Selmer guitars having serial numbers, the two UK and the European models were identical. 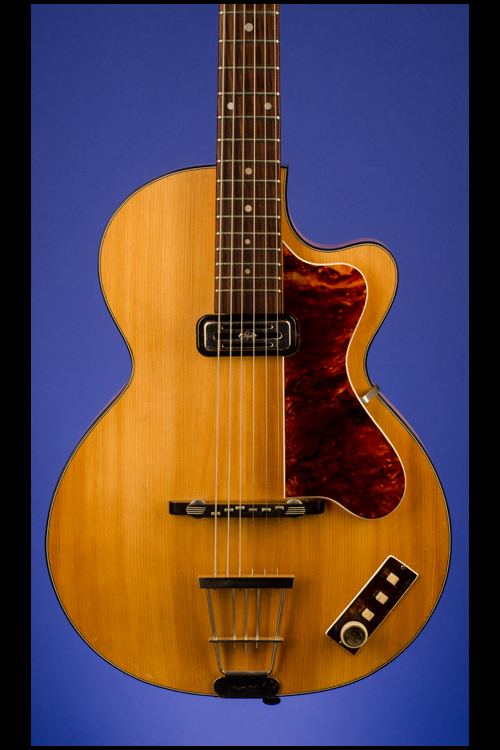 Pickups were initially rosewood "Black Bar" units followed in succession by plastic "Black Bars", "Toasters", and finally Hofner's Type 510 single coil units. Up until 1958, a circular or elliptical tortoishell control console with a rotary volume and tone control for each pickup was fitted. After that date, Hofner's rectangular control console was adopted. The Club 40 & 50 were finally discontinued in 1963. 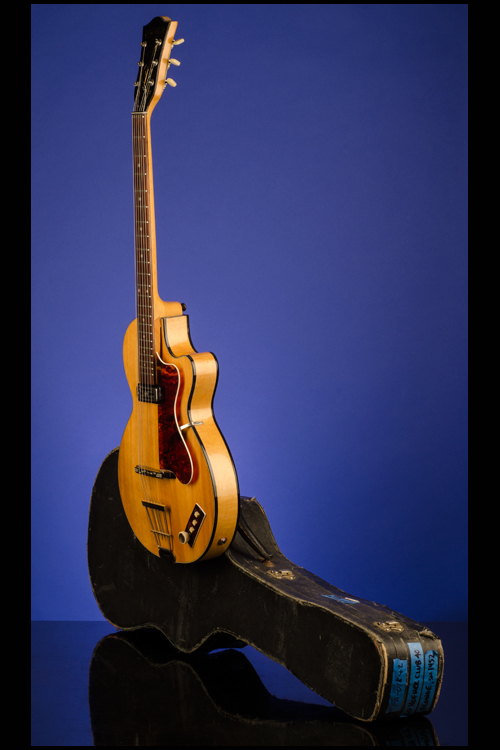 The most famous user of a Club 40 (1959) however was John Lennon, who eventually passed on this guitar to Paul McCartney. 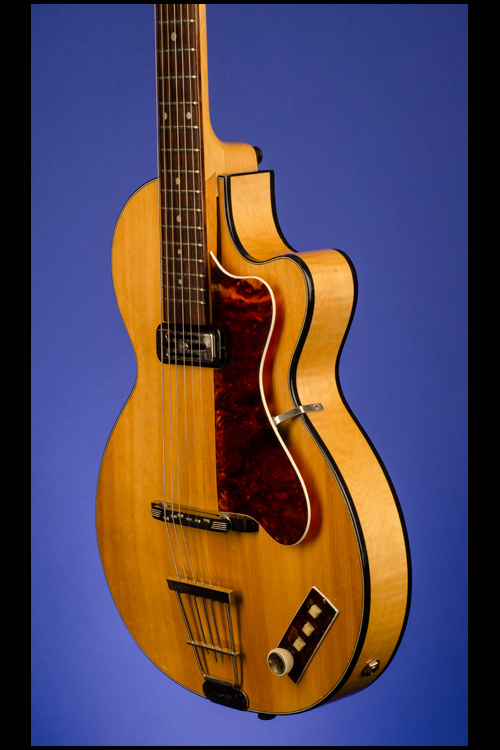 (Source: The Vintage Hofner website).